Such a busy year—a year that seemed to grow and grow. A year that took me on more planes, trains, and automobiles than I had ever imagined. And tonight, as Chuck Berry gears up to sing in Time Square, memories of 2011 flicker and glint behind my eyes. On a sunny day in Rome, I wore a white dress that fluttered in the wind as I rode over cobblestone streets on the back of a rented Vespa. That dress and that Vespa took me to the Sistine Chapel. There, my husband held me while I stood crying taking in the majestic images Michelangelo spent his life perfecting. In France, I wandered quietly through my beloved Luxembourg Gardens. Here, I did as the Parisians do: I sat on a willing bench, took up a book, and read in deep breaths, as chestnuts fell to the earth around me. It was at this moment that Autumn blew into the Parisian streets. I rode the elevator up to the Chase Tower Observatory in Dallas, Texas. I stood in the angled window, my feet and forehead pressed upon its enclosed precipice. Here I beheld the flat prairie land, which is wrapped and laced with ribbons of cars. It reminded me of when Kurt Vonnegut said “I want to stay as close to the edge as possible without going over. Out on the edge you see all kinds of things you can’t see from the center.” Funny, the closer to the edge of the world I’ve stood, the more centered I’ve become. Sometimes it is what we do not do that teaches us something. I didn’t reach Spanish shores this year as I had hoped, but I found that places come to us when we—and they—are ready. And that’s the exciting part: discovering where those places will be each year. Life changes quickly. Moments disappear before we have a chance to recognize their beauty. It is my hope that in this grand adventure we call “life on earth” that this next year will be a blessed year for everyone. and with more joy and laughter, because the road is long. The new year approaches, hour by hour. I am happy to see 2011 board the White Ship and sail to the Undying Lands in the west. Without letting the past go, we cannot open ourselves to the new. Yes. The clock tells me that its time to say goodnight to my laptop and celebrate the ringing in of 2012 with humans. I may be a New Yorker, but I plan on doing it the southern way: wash my hair, prepare some black-eyed peas for New Years Day, and put on a nice pair of heels. I cannot take credit for this recipe or the lovely photo above. It is from Best of Times Magazine. What a fitting magazine to quote on a New Year’s Eve. You can go directly to the site and have a look at it, or read it here. My New Year’s Gift to you!! In small skillet over medium heat, warm the oil and add the nutmeg, cinnamon and black pepper.Simmer for 2 minutes until the oil is well flavored and then stir in the hot pepper sauce. 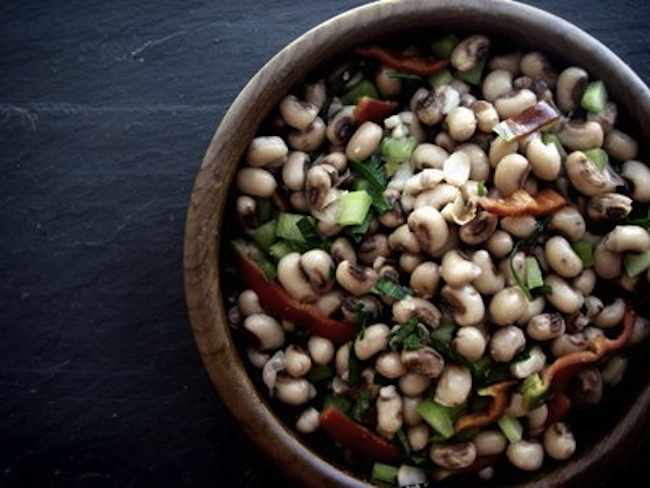 Put the black-eyed peas in a large salad bowl, pour the warm oil over them and toss. Add the celery hearts and leaves, basil, onion, tomatoes and pineapple. Serve at room temperature.